As I was looking for information about Mallard Ducks,because I got some for Easter,I discovered a cute little website about mallards. As I scrolled down there was an advertisement so I clicked on it. And thank gawd it was just what I was looking for! It has everything from games,IM,your own email,message boards,shout boxes,jokes,stories,surveys,and you make your own page and upload pictures! The creator of this website is Nicholas Hoza and I just want to say that he is the nicest person you could ever meet. 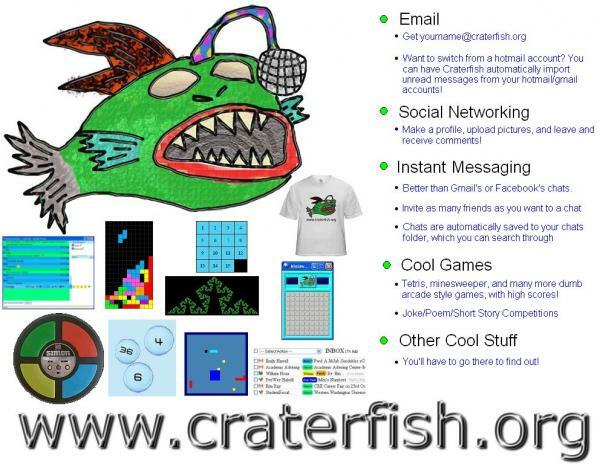 Craterfish.org is the best site ever! It may not be really “professional” like WordPress or other sites,but it isa really nice place where you can talk to nice people, and invite your friends to IM, or just play a nice game of “Minesweeper” or “Breakout”. Please take some time out of your day and go to this site. It really deserves to be spread around so others can join in the fun of Craterfish. And I thank Nicholas Hoza for taking so much time and effort to create this website,he did a really good job. Bravo!